Are you looking for a way to invest your money for retirement? Or, are you looking to build a stream of passive income? An income that regularly rises to keep up with your ever-increasing living expenses? What if that income was enough to make work optional? How would that change your life? 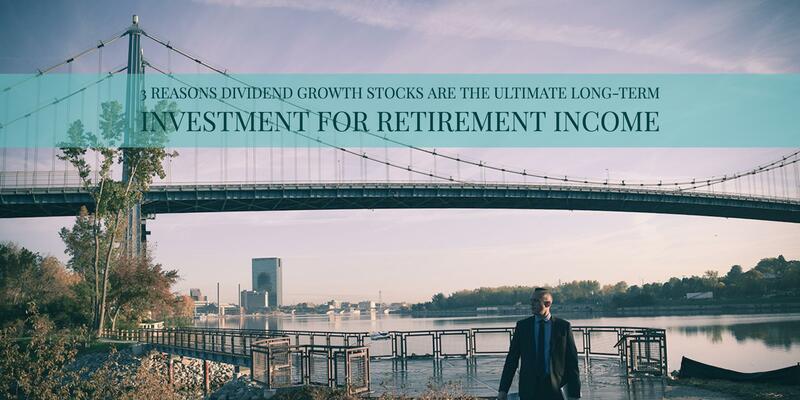 If you are seeking growth of your investments while also earning a stream of growing income, then look no further than dividend growth stocks. Thousands of stocks pay cash dividends as way to distribute profits to shareholders. The best companies increase dividend payments year after year. Since 1921, these dividend growth stocks have contributed an excess return of 7.5% over stocks that paid no dividend at all. The real power driving this return premium is the increase in income each year as dividends are increased. Over the 40-year period ending December 31, 2014, the average dividend paying stock generated a total return over 3.5 times more than stocks that did not pay dividends! Investors searching for income are forced to look beyond fixed income investments in today’s low interest rate world. Not long ago, an investor could invest in a 10-year US Treasury bond and get a decent income with little risk. The chart below shows that the interest rate on an investment in a 10-year Treasury has dropped from a high of 15.84% in 1981 to just 1.60% on September 30, 2016. If you look at this rate after inflation (which is currently 2.3%), you are left with a negative yield of -0.7%. In other words, if you are investing in 10-year Treasuries today, you are losing money after you factor in inflation! So, what’s a conservative investor to do?! If you are investing with a time-frame of 10 years or more, then it is my belief that inflation will be a real threat to your portfolio. The chart below shows you the impact of a 3% inflation rate. So, if we assume you’d like to live on a nice, round number of $100,000, this chart shows you the future income you will need to maintain your lifestyle. After 30 years, and an inflation rate of 3%, you will need nearly 2.5 times the income you started with! As you can see, a fixed income portfolio won’t take you very far with today’s low interest rates. Most investors will need to follow a plan that will grow their income throughout retirement. Today’s retirees will need to invest differently than the retirees of the 80s and 90s. Back then, a retiree could build a laddered bond portfolio and enjoy yields of 5% or more. Today, it is tough to build a bond portfolio that will exceed inflation. That doesn’t mean that bonds don’t have a role in your portfolio. Bonds will still act as a great diversifier and help minimize, or cushion, the possible downside volatility you will see in your stocks. But, don’t expect to see high income or growth from your bonds. As you can see in the next chart, the dividend yield on an S&P 500 ETF is currently 2.11%. So, the US stock market is currently yielding more than the 10-year Treasury Bond! But don’t just buy the market. Be selective by establishing your criteria for a strong dividend paying stock. Build a portfolio of stocks in a variety of industries and you have the potential to do quite well with your money over the next 10 years or more. Volatility leads to some really bad decisions. When stocks dive, investors are prone to panic-selling…leading to lower returns. As investors, we want to look for the best returns with the lowest amount of risk, which is often expressed as volatility. Dividend growth stocks have shown higher returns with lower risk than stocks that don’t pay a dividend. Furthermore, dividend growers also produce better results with less risk than companies that pay a dividend but don’t grow those dividends. By owning dividend growth stocks, you are likely to experience less volatility. Furthermore, if you’ve done your research on the companies you own, when volatility comes you can be confident that they are durable enough to withstand a recession and sustain their dividend. One more thing to think about is that as you extend your time horizon, you reduce the probability of losing money in the stock market. As you can see in the chart below, 94% of all 10-year periods since 1926 have had positive returns. If you extend your time horizon to 20 years, you can have even more confidence that you will make money in the stock market. History doesn’t always repeat, and past performance doesn’t guarantee future results, but it’s good to know that there has never been a 20-year period where the S&P 500 has lost money. These probabilities are why I have confidence saying that an investor is more likely than not to experience better results from investing in high quality dividend growth stocks than bonds over a time-frame of 10 years or more. Especially in today’s interest rate environment. Historically, we have seen that dividend stocks have offered a great way to invest to see returns better than the market and to generate increasing income. However, it is important to recognize that with low interest rates, investors’ search for yield has bid up the price of some dividend stocks, which may lead to lower returns in the coming years. Before buying a stock, you will want to be sure the valuation is reasonable. A great place to start is by looking at the company’s P/E and P/B ratios relative to the company’s historical range, as well as other stocks in the market. 1) They have historically generated higher returns than non-dividend paying stocks. 2) They offer higher yields than bonds and can be a great alternative if your time horizon is 10 years or more. 3) They are less volatile than other stocks making it easier to endure corrections in the market. This post is one of a series of notes on the sessions I attended at the AICPA’s 2014 Advanced Personal Financial Planning Conference. You can find links to all my notes from the conference here. This past Monday (1.20.2014) Rebecca Patterson, Managing Director and Chief Investment Officer at Bessemer Trust, presented her investment outlook to the attendees at the AICPA conference. Patterson believes that the Fed is the most important factor to watch in 2014 as it will likely be the primary driver of the markets. The Fed’s “QE” has been fueling higher stock prices. Last week the Fed balance sheet hit a new milestone…$4 Trillion. She thinks it’s likely that we will see the Fed continue to taper by reducing bond purchases at rate of $10 Billion per month. Will the end of easy money mean the end of rising stock prices? It is important to remember that tapering isn’t tightening. Monetary policy is still easy and tapering remains a dovish stance. The US remains politically challenged. For the average American who loses their job today it takes 9 months to find a new job. Governments don’t have much room for further fiscal stimulus. Last week Brazil raised short-term interest rates (Fed’s equivalent) to 10.5%. Emerging markets are unlikely to sustain a rally in the short-term. Valuations are attractive, but there are too many headwinds including the ripple effects of the Fed tapering. The worst case for emerging markets: Yellen and the Fed turn out to be more hawkish than expected, and we see a repeat of last May and June where yields spike and the emerging markets come under pressure. Patterson’s most out of consensus view is that the US economy will surprise to the upside, despite all of her concerns. The US economy is currently at record exports. Why? Because the US Dollar is weak and demand from Europe and Japan is increasing. In 2008 the US produced 78% of the energy it consumed. Today, we produce 90% of the energy we consume. 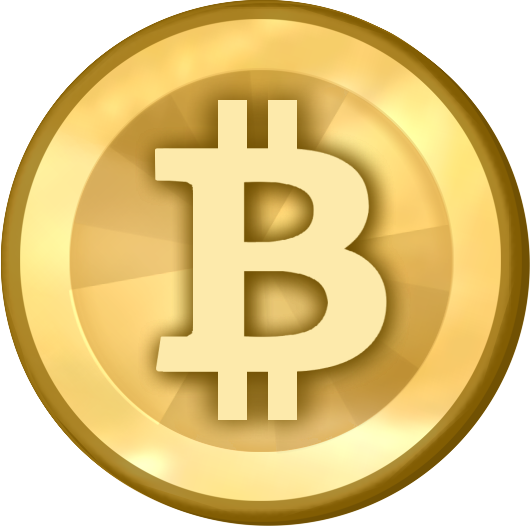 …will continue to be very supportive for financial markets. Over the next five years we will see relatively higher inflation, but inflation is not a concern for 2014. …are showing relative economic improvement. …looks stable in the near-term, but longer-term challenges remain. China’s investment is nearly 50% of GDP, and household consumption is around 34% of GDP. China is faced with the challenge of rebalancing to a consumer based economy. 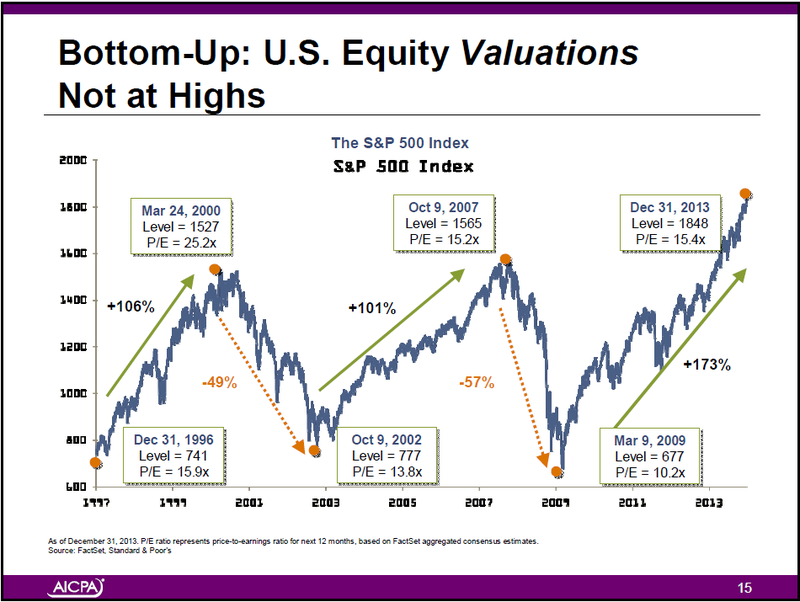 US equity valuations are not at highs. The 12-month Forward P/E of the S&P 500 is 15.4…a tiny bit above the long-term average, but not an egregious valuation. This valuation is similar to the 2007 peak, but nowhere near the 200 peak of 25.2. The market is fully priced, but Patterson wouldn’t sell stocks solely on this measure. From 1.1.2007 to 11.30.2013 cumulative net fund flows into bond funds have been $1.3 Trillion. Flows into equity funds have been $496 Billion. There was a reversal in 2013 as we started to see investors pull money out of bond funds and add to their stock funds. With interest rates as low as they are and the possibility of rising rates, this trend is expected to continue. Fund flows into equities are also likely to continue given the good year for stocks in 2013. In the near term, corporate profit margins are sustainable. Historically profit margins peak when wage growth hits 3.5%. We’re not there yet. We are a long way from meaningful wage inflation. The firm currently has its largest overweight to equities in years. Question: What’s your economic or investment outlook? Share your thoughts in the comments. This week I attended the AICPA’s annual Advanced Personal Financial Planning Conference (#AICPAPFP). The conference is in Las Vegas, but I attended virtually. A huge “thank you” to the AICPA for offering the virtual option. I would love to see more conferences offer an online option (i.e. Morningstar’s annual Investment Conference). This conference was, by far, the best I’ve attended in quite some time. Michael Kitces promotes it as one of the 8 best conferences for financial advisors, and the best conference for technical content. I couldn’t agree more. If you want to learn and improve your skills as an advisor, you will want to put this on the calendar for next year. Save the date: January 19-21, 2015 at the Bellagio in Las Vegas. Over the next few weeks I will be blogging my notes from the sessions I attended. Stay tuned to this page for link’s to all my notes. Question: What conferences do you attend? Please leave your favorites in the comments.